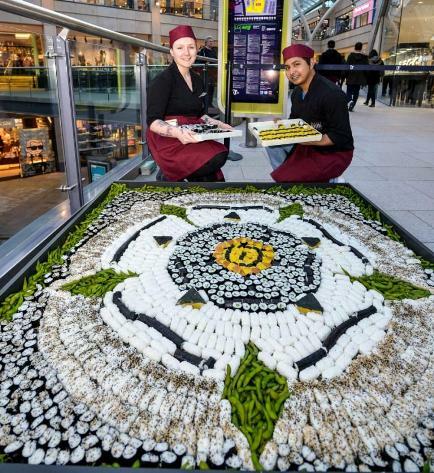 To celebrate its opening in Trinity Leeds, Japanese food giant, Wasabi Sushi & Bento, has built a giant white rose – made from sushi. Wasabi opened the doors of its two new Leeds branches last Wednesday (19 February), having invested more than £1million to expand outside of London for the first time. The Japanese food specialist created the giant white rose, made up of more than 2,500 individual pieces of sushi and 600 edamame beans, to celebrate the landmark opening. Its opening day saw more than 100 people queuing outside its new branches in Trinity Leeds to be in with a chance of winning free sushi for a year and, since opening, Wasabi has served more than 8,000 hungry Leeds shoppers. Wasabi has created more than 50 new jobs in the city and will provide Leeds’ shoppers with distinctive Japanese cuisine at affordable prices, making it a regular healthy treat, rather than an occasional luxury. Made from scratch in-branch every morning, Wasabi’s sushi is made using only the freshest and finest ingredients including Scottish salmon and line-caught Yellowfin tuna, which are responsibly and sustainably sourced. “We’re delighted to have opened in Leeds. “We choose our locations very carefully and Leeds, as a leading retail centre with a vibrant business community and huge student population, is a major draw.